Sandler Office‘s new desking system is ideal for offices that require flexible work areas. Nomado is a completely mobile workstation fully equipped with electricity, task lighting, storage, and ample workspace. It doubles as a room divider, and you can add a whiteboard for collaborative spaces. Image courtesy of Sandler Office. We reached out to the folks at Sandler Office to get the scoop on their new mobile desking system, Nomado. Here’s what they had to say. How will Nomado impact the workplace? Sandler Office’s Nomado is an entirely new concept in mobile desking. It’s an innovative, highly portable desking system, ideal for areas that require mobile workspaces, flexible work areas, or use in guest rooms in place of the traditional desk or built-in cabinetry. Nomado comes in a single sided or double-sided version with fold down worktop and shelves. Both versions are fully wired with electrical outlets, integral LED lighting, and storage space for desk accessories. How does it contribute to “new ways of working”? Nomado addresses the flexible needs of today’s modern workspace. 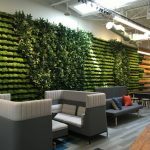 Whether it is creating collaborative areas or individual workspaces, it can easily adjust depending on the type of environment or the work area needs of the employee. For designers, it’s go-to product whether selecting product for a flexible contract space or a guest room work area. Can you tell a story/give an example of a client who has used Nomado effectively? 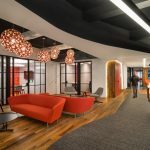 For their new London offices, corporate end user KPMG ordered Nomado with whiteboards on both sides (64 of them) to be used as white boards and room dividers, as well as work surfaces when needed. Nomado is available in a double-sided version. Image courtesy of Sandler Office. Renowned designer Martin Ballendat designed Nomado. Nomado was created to specifically address the need of space availability in the workplace environment. The concept of mobile desks is not a new one, but has so far been poorly implemented. While progress in the design world often happens through incremental improvements on existing concepts, Sandler has taken a quantum leap, reinventing the concept of mobile desks. Nomado is a mobile desk designed to be a comprehensive system that offers all the amenities needed to get work done, namely electricity, task lighting, and ample work surface while achieving 75 percent economy of space. Here’s Nomado in the folded position, saving space when necessary. Image courtesy of Sandler Office. Nomado strikes the delicate balance between mobility and functionality, and adds versatility to the mix by doubling as an ideal ad hoc room divider. When not in use, Nomado can also be stacked horizontally, and at 10cm thick stack up to eight units in the space needed for only one conventional desk. In addition, Nomado offers worktops coated in a soft material that gives a new dimension of comfort, warmth, and intimacy between the user and the work surface, which makes working a more personal and enjoyable experience. What do you think our readers will love about Nomado? Readers will love Nomado’s flexibility and its extremely thoughtful design. There is nothing that the designer hasn’t thought of – from its complete ability to be mobile to integral lighting and storage space. In fact, Nomado also nests when it’s in the folded position. Nomado is mounted on casters for ease of portability and designed to nest for high-density storage when in the folded position. When open Nomado offers a sturdy work surface and shelf secured with steel wires and pneumatic springs in both single sided and double-sided versions. The rear of the single sided version can be used as a white board making this a highly versatile tool for training and presentations. Nomado comes in a selection of finishes and color options in both fabrics and laminates all encased in a sturdy aluminum surround.